QR (Quick Response) codes are a type of data matrix barcode made up of a pattern of black squares on a white background, with larger squares at three corners. The white border is part of the code. 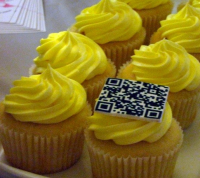 QR codes can be read by specialized scanners, by mobile phones with cameras, and by smartphones. Mobile phones and smartphones require a reader application to display information associated with a QR code, native on some of the newer models of phones. Free QR code generators can be used to generate QR code images. For example, using the Kaywa QR code generator or Mobile-Barcodes, you simply enter a url, text, phone number, or SMS text message that you’d like to associate with your QR code. 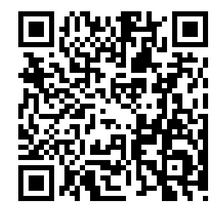 The QR code image is generated along with an image url and html code. Other sites, like QR stuff (not free), also allow you to link codes to email addresses, Google Maps locations, contact details (i.e., a Vcard), and your social media sites. You can affix a QR code to any tangible object (a piece of paper, a business card, a sign post, a shirt, a building, etc), which allows anyone who scans that code to access the information you’ve associated with it. Data matrix codes have been used since the 1960’s and QR codes since the 1990’s. You’ve seen them on UPS packages and on your airline boarding passes. But the idea of using mobile devices to read these codes is newer and this use complements augmented reality applications of these devices. Augmented reality refers to technology that modifies a user’s “real” view of reality with computer-generated imagery. To link artwork at a museum to information about the artwork, the artist, the historical period, etc. Of course, when you consider linking and mobile learning (mlearning) more generally, you need to consider your target audience and their access to smart phones vs more basic mobile devices. You’ll also need to get the word out so that your learners know how to recognize QR codes when they see them, so that they’ll actually use their mobile devices to learn more about the tagged items. QR codes offer the opportunity to create a more connected world and make the issue of digital literacy even more important. As you create information mobile learners can access via these codes, consider including critical thinking prompts and ways for users to input their own thoughts about objects (e.g., through questions, answerable using short texts that they might expand upon later) in your linked information. And don’t forget to look for more QR codes in the wild. This entry was posted in augmented reality, QR codes and tagged AR, augmented reality, barcodes, cell phones, data matrix codes, digital literacy, information tagging, m-learning, mlearning, mobile devices, mobile learning, QR codes, smart phones, smartphones. Bookmark the permalink.